An arsonist is loose in New York City, paid to set specific buildings on fire by Ms. Boldd (also known as Vendetta). At the same time, a monster attacking people on the streets, liquefying its victims as it feeds. The star of the book, Shadowhawk, stalks the very same city, breaking the spines of criminals he catches in the act. He even manages to catch Arson, blowing him up by throwing a shuriken into his explosive, gas-filled “backpack”. And, in the next issue, Shadowhawk hunts down the Liquefier and tears his heart out. This take-no-prisoners vigilante has the police worried so they call in the “big guns” to bring him in: the Savage Dragon! Treating us readers to a big brawl, the Dragon and Shadowhawk engage themselves in a grand fight in the city. Luckily for Shadowhawk, he’s rescued by Blakjak another of Vendetta’s minions. 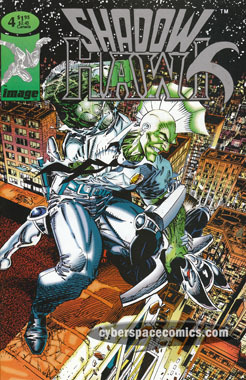 Vendetta offers Shadowhawk a position in her crime cartel alongside her, Vortex (a wind-powered female), a mutated Arson and Blakjak but he declines the offer. Now that he knows the cops don’t approve of him … and the criminals do … Shadowhawk’s got a lot of self-analyzing to do. The Bad: The vigilante super-hero has been done many, many times before and the art in issue one is pretty bad, compared to other work I’ve seen by Valentino. the Good: Plenty of action to be had here and an appearance by the Savage Dragon as well as a cameo by Spawn (in issue #2). Fans of enhanced covers will be happy: issue one has a silver-foiled, embossed cover; issue two has a silver shine on certain parts of it and issue three glows in the dark! The art starts off ill-formed in many spots but quickly progresses to the level of quality Jim Valentino is capable of. But, really, the best draw of this series is that there’s a mystery brewing over the identity of Shadowhawk. The book introduces many characters that could be the vigilante but, it does not reveal who it is! The Verdict: It’s an action-oriented, fast read that presents the mystery of Shadowhawk’s true identity. However, the script, plot and art are somewhat rushed. It seems to try to fit too much into this one mini-series. But, with all that said, I’m curious to find out the secret ID of the vigilante … so I’ll be reading the next series.